A few years ago, okay 4 1/2 years ago (where does the time go!! )I got to take a girls weekend with my best friend to NYC to celebrate my 30th birthday! A few weeks later my husband lost his job, so I’m so grateful I went when I did because it’s not going to happen again for a long time! ANYWAY! While we were there we went to Serendipity to try the Frozen Hot Chocolate! It was served in a giant bowl just like this one, overflowing onto a plate! It was fantastic and I KNEW I could make my own version. SO I went home and played around different variations tweaking my homemade Hot Chocolate. I tried using ice cream, using ice in a blender and using the ice cream maker. I found that the Ice cream maker created the BEST texture, great crystallization, for slushy perfection. I love create a mint version of this, and even an amaretto version (one of my favorite flavors with chocolate). I think I’m going to try a peanut butter and a coconut version as well. Just switch some of the extract for anything else you want to try. 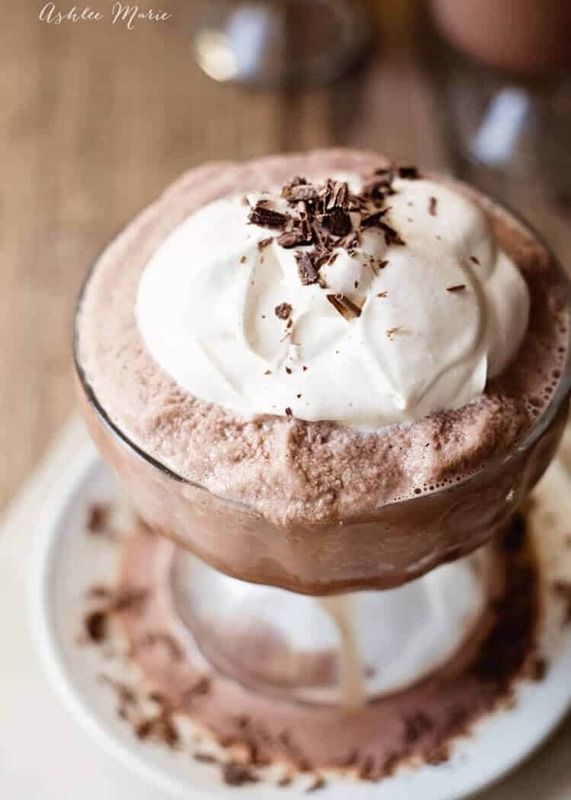 Then I top it with loads of fresh whipped cream and some shaved chocolate to make it pretty! Serve it overflowing onto a plate to be JUST like Serendipity, but it IS a lot, so for my kiddo’s I use smaller containers. Serve it fresh, it won’t freeze quite right. Add the water, whisk and cook over medium high heat until it boils. Let it boil for 1 min then add the milk, cream and vanilla and stir well. Stir it well again and pour it into the ice cream maker and turn it on. 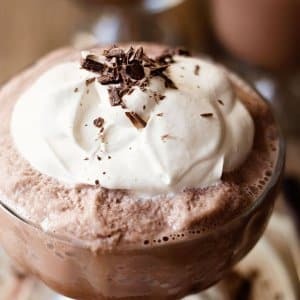 Mmm I haven’t ever tried frozen hot chocolate, but I have wanted to and I love that I can make it in an ice cream maker! I’ve seen people make it in a blender with ice, but I really love it this way, no watering down hot chocolate for me! Whole milk, chocolate turned into frozen crystallized goodness!!! Mmmm I want more now! Oh my gosh I am seriously drooling over here! Pinning this for sure! 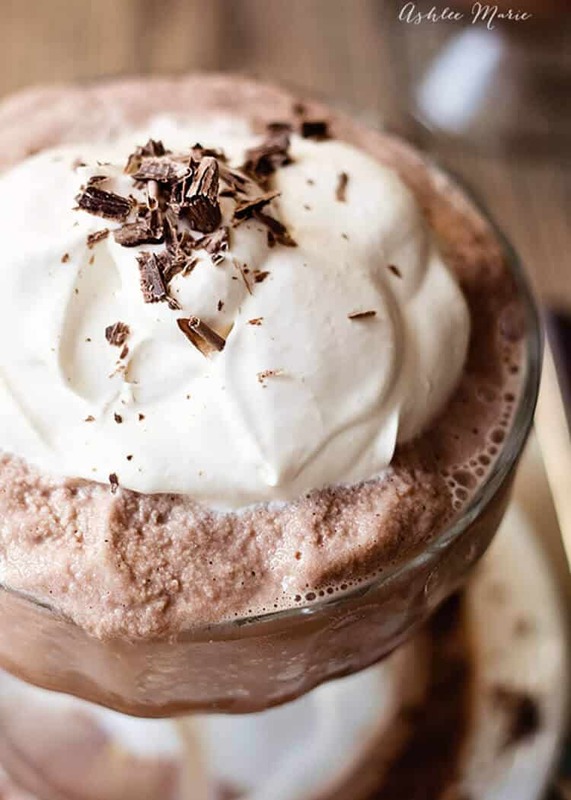 I’ve heard of frozen hot chocolate, but I’ve never had it! I can’t wait to try it out. Looks amazing! It’s SOOOO good!!! We should have another get together and vote on a favorite treat from each blogger! wouldn’t that be fun? How many servings does this make. We are having a Frozen Night Time Play Date in a few weeks and all the “Elsas” will flip for this. Just want to make sure I have enough for all of them. Thanks! um it expands a bit as it goes though the machine, but just over 4 cups. that’s simply as much as the ice cream maker will hold, if you have a larger maker you can make it bigger! Wowza! This looks fabulous!!! Happily stumbling and pinning this one!! Thanks! 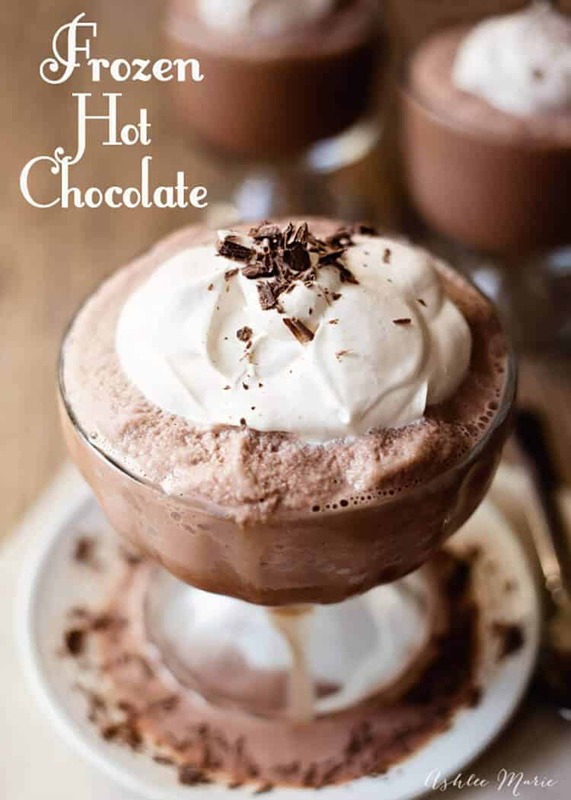 It’s one of my all time favorites, but I love love LOVE the flavor of hot chocolate so it’s a great way to enjoy it year round! Can’t wait to try this. And as luck would have it, my ice cream freezer insert is frozen and ready to go. I’m thinking afternoon snack! YAY! I bought a second insert cause I use it so much and I always have one frozen! I can’t wait to hear what you think! Thank you for letting me relive this delicious drink all over again! you are SO welcome! A favorite of mine for SURE!